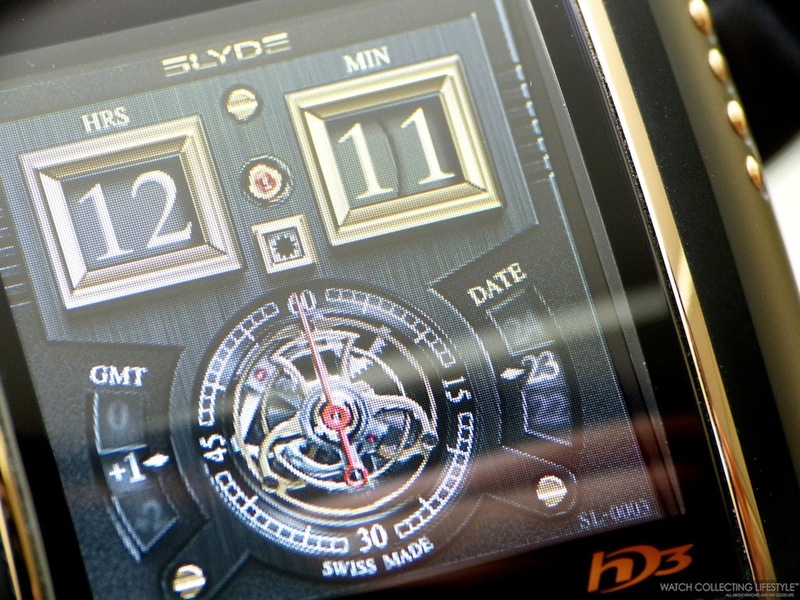 Video: SLYDE HD3 & S1. A Digital Swiss Timepiece with Multiple Displays. SLYDE watches are perhaps the coolest digital display watch in the market. These watches draw on a whole range of groundbreaking technologies and merge them into the world of 21st century luxury watchmaking in a user friendly digital timepiece. Incorporating the craftsmanship and accuracy of high-end watch-making, the technology of an internet platform and the aura of prestige, SLYDE features a touchscreen powered by a high-tech graphic engine with a groundbreaking navigation system. Posted on February 15, 2014 by Editor & Publisher and filed under Slyde, Other Brands, Videos and tagged Slyde Slyde HD3 Slyde S1. Insider: SLYDE HD3 & S1. A Luxury Swiss Made Digital Timepiece with Character. SLYDE watches are perhaps the coolest digital display watch in the market. These watches draw on a whole range of groundbreaking technologies and merge them into the world of 21st century luxury watchmaking in a user friendly digital timepiece. Incorporating the craftsmanship and accuracy of high-end watch-making, the technology of an internet platform and the aura of prestige, SLYDE features a touchscreen powered by a high-tech graphic engine with a groundbreaking navigation system. 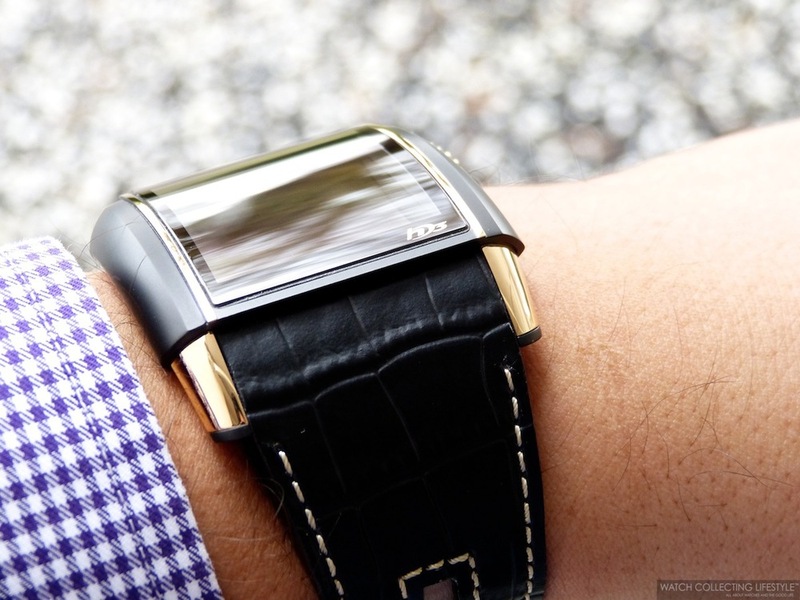 Thanks to the host of display combinations, users can generate an endless variety of movements on their wrist. SLYDE was founded in 2005 by Jorg Hysek Sr. and Fabrice Gonet. Jorg Hysek Sr. is the world-renowned watch designer behind iconic timepieces like the Vacheron Constantin 222, the Breguet Marine, the TAG Heuer 6000 and the TAG Heuer Kirium, amongst many other timepieces from brands like Tiffany & Co., Dunhill, Cartier, Ebel and Boucheron. Fabrice Gonet, is an esthete of the alternative scene, whose creativity is inspired by science-fiction and steeped in technology. During his earlier years he made many important encounters and brought his expertise to new brands such as Romain Jerome, for which he created the first timepiece in collaboration with Jean-Marc Wiederrecht, and Volna where he supervised the creation of the entire line. The innovative display of the SLYDE watch, enables the user to generate an infinite variety of timepieces on his wrist. This range of multiple watches in one has been made possible by creating top-quality virtual modules. Slyde's patented bi-axial navigation system shows every form of time: On the vertical axis, present time offers a variety of watch interfaces for a customized indication of the current time. The SLYDE watch was made according to the traditional standards of top-grade Swiss watchmaking and is labelled “Swiss Made”. Fitted with a generous and robust tonneau-shaped case measuring 47.71 mm in length, 57.84 mm in width and 17.53 mm in thickness. The SLYDE watch is available in different metals including stainless steel, PVD steel, titanium, PVD titanium and 18K rose gold. All SLYDE watches are powered by an electronic movement with a lithium 3.8V rechargeable battery that gets charged via USB. To charge the watch, you need to put it on a small charging station that magnetically adheres to the watch case back. A full charge typically lasts around seven days depending on how frequently you check the time or you play with the watch. The watch is also fitted with a nice battery indicator —located on the right top side of the case— composed by five small LED dots that light up in blue whenever the watch is tapped to check the time. If the five dots light up, that means that the watch is fully charged, one dot means the watch needs to be charged. Even though the watch is fitted with a charging port on the back, it is water resistant to a depth of 30 meters. The SLYDE is a very comfortable watch that tends to be very light and that wraps around your wrist almost like a bracelet. The watch is fitted a case-wide black leather strap with contrast stitching and a deployant buckle. 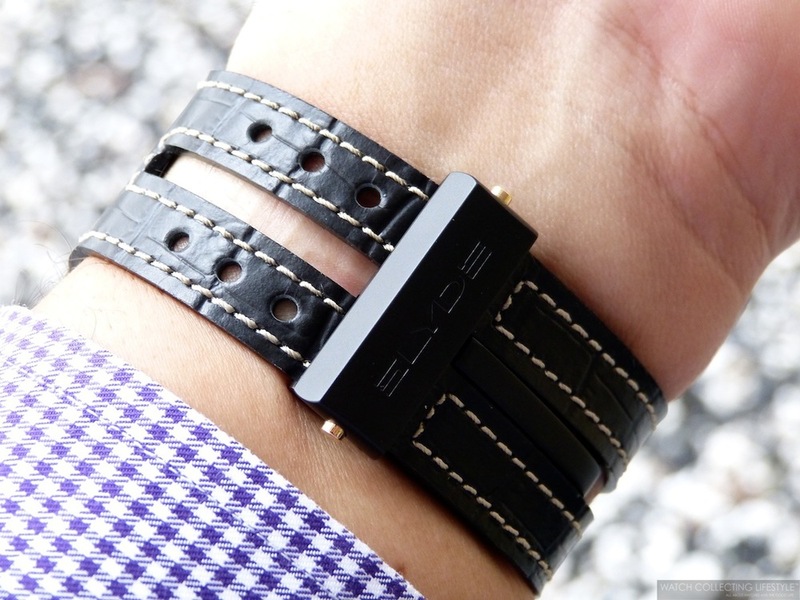 The leather strap is nicely finished with a texture that resembles an alligator strap. The touch-screen on the SLYDE is nice and bright and comes with a resolution of 232 x 240 pixel with a 28 x 29 mm active zone. By tapping or sliding a finger on the screen the wearer selects a display from the range of modules, scrolling from an animated virtual mechanism in 3D to a digital module that can be entirely configured to personal preferences. Each movement displays seven functions: the time, the date, time zones, a calendar, the moon phase, a chronograph and a countdown timer. On the horizontal axis, past and future time can be fully personalized by activating the time elapsed since an occasion or the countdown of time remaining until an event —using personal pictures and integrated indicators. Once you tap the watch screen to check the time it is extremely easy to navigate through the different options and available engines. While reviewing the watch we also noticed that the screen turns on by rapidly turning your wrist around to check the time and without the need for the quick tap. All watches are preloaded with three different engines and additional engines can be purchased as add-ons. If you quickly tap on the screen while the engine is on display, the animation comes to life. Below you will find a video We have added a video that shows the display in full action. On the wrist, the watch wears comfortably and perfectly wrapped around your wrist as long as you have a wrist of at least 7.25" in circumference. Those with smaller wrists will find it almost impossible to wear this watch the right way. If you'd like to own a Swiss made digital watch with the coolest concept and functionality, look no further. Next time you are spinning at Pacha or Space in Ibiza, this watch will complement your look and match the bright lights of your turntable and mixer. Sticker Price $14,500 USD for S1 with PVD steel plates and gold lugs. $7,050 USD for HD3 in PVD Titanium. For more info on SLYDE click here. Posted on February 15, 2014 by Editor & Publisher and filed under Other Brands, Slyde and tagged Slyde HD3 Slyde S1 Jorg Hysek Fabrice Gonet.